The first How to Train Your Dragon was a great example of a movie adaptation that managed to become a great movie experience without the need to be totally faithful to the source material. We've seen quite a number of movies like this since then, but in the animated world, this one seems to stand out to me for one reason or another. 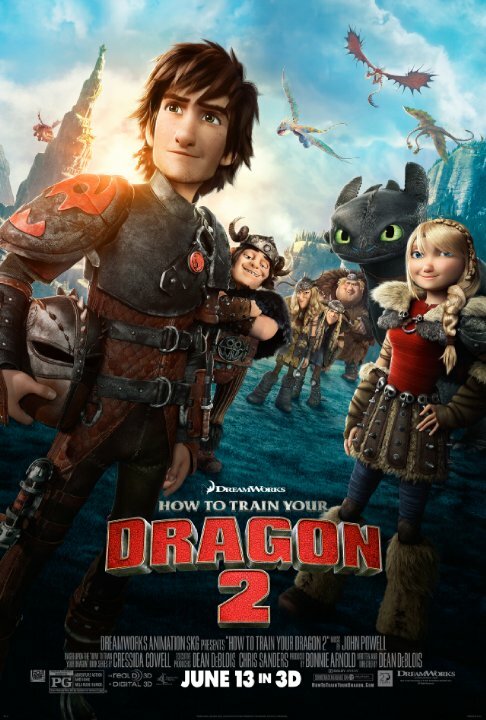 How to Train Your Dragon 2 continued to explore the world created in this movie franchise and augmented by the Nickelodeon TV series. I was looking forward to this movie, but life obligations prevented us from catching this in the theaters. Thankfully, home video solutions exist and thus we finally got to watch this movie. The movie certainly tried to introduce a number of new concepts into the world including new territories, alpha dragons and other dragon-riding groups. Of course with all these new ideas, it easy to get a little overwhelmed with all that's happening. Add in the fact that there's quite the big antagonist-driven plot that has to go alongside all this and things do get more than a little messy. Synopsis: How to Train Your Dragon 2 is the 2014 sequel to the 2010 movie as written and directed by Dean DeBlois. A third movie in the franchise has already been announced. Five years after the events in the first movie and the Vikings of Berk now live in harmony with the dragons. Their new society has both groups well integrated with one another. And our hero Hiccup (Jay Baruchel) continues to make further and further flights around Berk as Hiccup tries to map out the territories and find new dragons to bring into the fold. However these trips also serve as a way to avoid speaking to his father, Stoick the Vast (Gerard Butler), who is eager to start discussing future plans of Hiccup becoming the next chief of the village. During one of these exploratory flights, he and Astrid (American Ferrera) discover another island fort that appears to have frozen over. They also have an encounter with Eret (Kit Harrington), a dragon trapper, who claims to be capturing dragons for someone known as Drago Bludvist (Djimon Hounson). Hiccup and Astrid go back to Berk to warn the village and hope to get Stoick to do something to deal with Drago and his dragon army. It's interesting how much things have changed in a mere 5 years given the more mature story that drives this movie. This isn't exactly a bad thing since it did make for some pretty good storytelling here. Not only do we have this big bad threat in the form of Drago, but we also got to revisit another aspect of Hiccup's past - the fate of his mother. There's sort of a big philosophical argument of sorts that drives this movie forward. Drago and his forces rely on strength and even fear to control their forces and ultimately their dragons. And of course Hiccup and the rest have bonded to their dragons by creating genuine trust and loyalty. And the big question remains is how the two forces will clash and how the two different approaches to taming dragons will face one another. The whole thing about dragon alphas was a little weird at first, but in the end I guess it wasn't too bad. Of course this idea was first stressed in the trailers by presenting a really big dragon, following the sort of classic principle in the animal kingdom how alphas tend to be larger and also more dominant. The very alpha principle at work seems to echo Drago's own beliefs about how the right to rule is derived from strength, so it was interesting to see how this angle also got resolved at the end. My apologies for being vague - I'm trying to avoid spoilers here. There's a lot of back and forth though as the folks behind the movie had to squeeze in screen time for the rather significant supporting cast. Given a lot of the kids were featured in the animated TV series, I can understand why they had to make sure that we still saw a lot of them in this movie. Their scenes were still pretty funny and provided some laughs here and there. But admittedly it somewhat slowed things down when a lot of the action was tied to Hiccup and his immediate family. Definitely some great action sequences as well and some kaiju-style moments given the sheer size of the alpha dragons versus all the others. It was a little quirky how most of the free dragons are all bright and colorful while those under Drago's command immediately become darker and drab in tone. But it's still a children's movie and of course it's important to highlight the difference between the good guys and the bad. How to Train Your Dragon 2 is a nice evolution for the series, but admittedly it's not quite as kid-friendly as the first one. It still presents a solid entertainment experience and lots and lots and lots of colorful dragons. So the movie rates 4 new dragon types out of a possible 5.